A modern, minimalist 2016 chalet, Jun is beautifully located in the quiet lower end of Hirafu Village, a short walk from all the action of Japan’s Niseko ski resort destination. The six en-suite bedrooms include two master bedrooms, three guest bedrooms, and a kids’ room with four bunk beds. Standout features are the luxuriously spacious open-plan living and dining room with floor-to-ceiling windows looking out at views of Mount Yotei, the slopes, and a stunning forest landscape. Jun accommodates up to 14 guests, making this a perfect chalet choice for families or groups of friends enjoying an action-packed ski holiday. Both master bedrooms are situated upstairs and look out to a gorgeous snowy scene in winter through window doors that lead out to a balcony to breath in the fresh mountain air. After a day on the slopes, a double rain shower wet room is the perfect way to unwind for couples before a beautiful evening in the warmth of the chalet’s welcoming living space. Meanwhile, guest bedrooms boast window seats for contemplating the beauty of the scene outside. With high ceilings, with an uber-cool, long gas fireplace feature, comfy facing sofa, and a dining table with views out to the magical scenery the living and dining space at Jun merely is stunning. The white floors and uncluttered design create light and space that gives the upper-level room a trendy look. The fully-equipped kitchen with counter island and bar stools add to this welcoming sense of togetherness, while comfy chairs create a separate place to sit with a morning coffee perhaps. A balcony runs along the side so that the indoors and outdoors are seamlessly connected, while a 60” flat-screen Apple TV, audio system, and Bluetooth ensure digital connectivity. 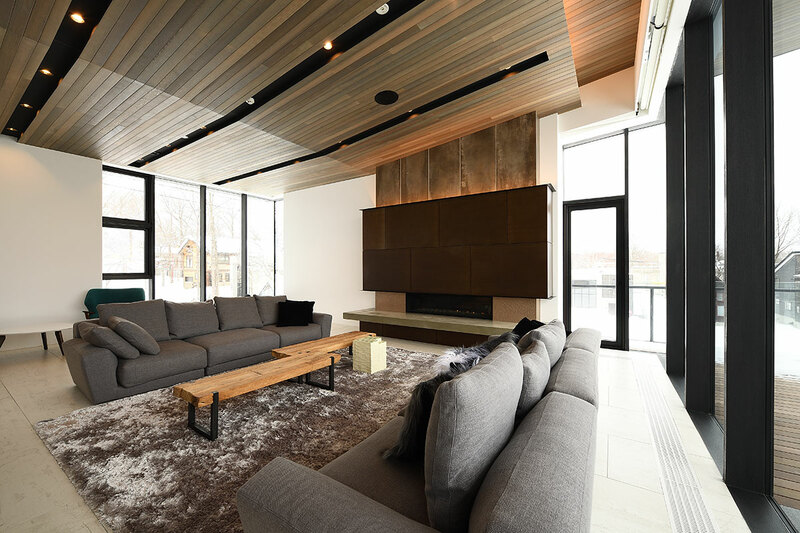 Product Description: A modern, minimalist 2016 chalet, Jun is beautifully located in the quiet lower end of Hirafu Village, a short walk from all the action of Japan’s Niseko ski resort destination. Send an inquiry about Chalet Jun, Niseko.